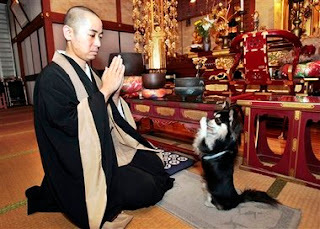 a dog at southern japan trying to mimic his master, a zen monk, in southern japan temple. The one and half year old chihuahua named conan as on the image above try to follow his master praying position by uniting its hand's palm in front of its face and maintain it. His master said that it only took a few days for him to learn the motion. Tourists flock into the temple after these news was spread across the nation. Now, his master tried to let the dog learn how to meditate but, of course not to put his leg crossing which is impossible, only sitting still while his master meditate.